Boy, did I take a lot of pictures on Sunday, because there are way too many projects underway right now. 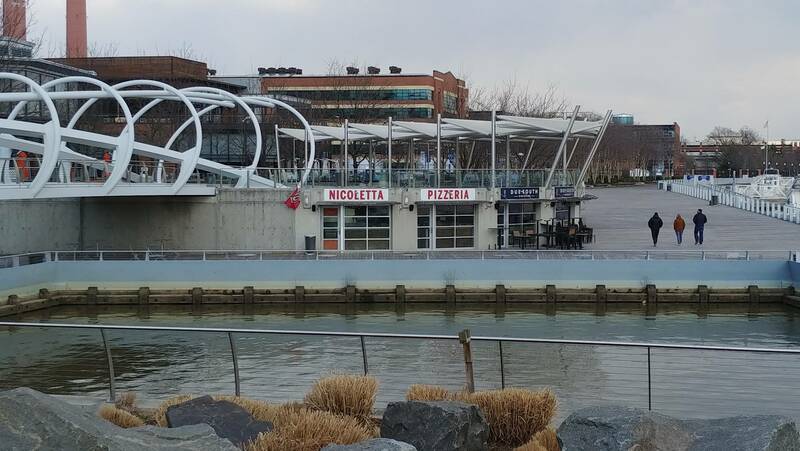 I decided to ease my way into posting photos with this survey of the latest signage around the neighborhood, but I'm starting with an image of the one spot that isn't "signed" yet but that is looking interesting, which is the Dacha space at Dock 79, across from the Nats Park "grand staircase" on Potomac Avenue. I didn't take a picture of the actual beer garden construction, since right now it just looks like a patio being torn up. Not sure if this signage is being saved for a future post, but I know it's one that some people around here care about. JD, Is this an homage to the Five Man Electrical Band? I'm going to have to work on my beach bod! In all seriousness, if you want to volunteer to help make the Anacostia River an even better waterway and amenity for our community, come volunteer on April 13 to help pick up trash. There promises to be plenty of trash this year for everyone to pick up. notified by the construction company performing the re-design of the curb-line on New Jersey Ave that they will start work on Monday, March 25. Work will begin early Monday morning. New Jersey Ave will be re-striped to reduce vehicle travel to one lane in both directions. Parking will not return to the southern portion of New Jersey Ave at any point in the future, this is a permanent change implemented by the District. In addition, on April 4, there will be a construction project started on Tingey Street that will reduce vehicle traffic to one lane while a drain pipe is installed across Tingey Street. This project will be located on Tingey Street just before you reach 3rd Street from New Jersey Ave. Employees should anticipate delays as they work their way through the defile. After business hours, Tingey Street will return to two-way traffic. @smitty Are you in the Yards? So this is referring to the part of New Jersey south of M Street? Interesting. Probably has to do with the impending Tingey Square construction. And probably also needed for pedestrian safety, especially at the Tingey intersection. Hi JD - Any news on what the new project is on the SW corner of L SE and 9th SE? Also, commercial projects in the Emblem condo building? @michaelj-- it is actually 818 Potomac Ave. Condos are planned here, where the surface parking lot was. They are tearing down a parking lot and putting up paradise. @MJM-- here is the website for Boom Box. Are you ready to go ten rounds with JD?